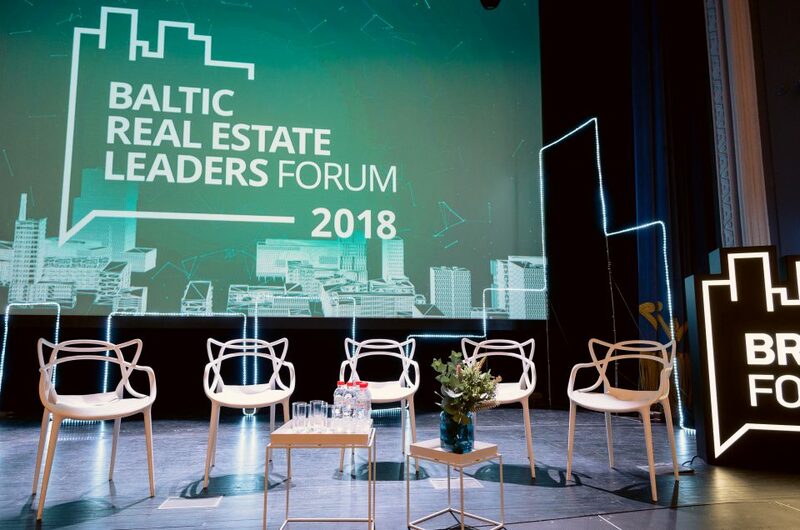 November 2 the annual Baltic Real Estate Leaders or BREL Forum took place at the VEF Culture Palace, bringing together leading executives of the real estate industry from Latvia and other Baltic and European countries. Throughout the day, global professionals discussed various important sector-related issues, shared their experiences, highlighted the main challenges and predicted future trends and their impact on the Baltic region. Experts focused on the leading trends of the moment: the ever-increasing impact of modern technology on the real estate market; the need for planning of smart and sustainable urban and working environments as well as an increase in the flow of investments in the property with added value. This year, the BREL Forum program was divided into three content-specific sessions that looked at the topical issues of the macroeconomic development, changes in real estate price levels, demographic and political aspects, market investments, urban space development, retail sales, digitalisation, as well the impact of e-commerce on traditional shopping centres. At the end of each session, interactive expert panel discussions encouraged an in-depth conversations of the topics, involving the audience and inviting all those present to ask their questions and express their opinion through online voting. The forecasts by the forum’s lecturers predicted that the role of technology will continue to grow in the coming years, affecting both – real estate business and traditional retail sectors. At the same time, the construction of new projects will be more likely to be replaced by the renovation of already existing buildings and a boom of industrial parks, highlighting new trends in the currently tumultuous investment market. Hanriette Vamberg, Partner and Managing Director at Danish architects company Gehl Architects, opened the forum by emphasizing that intelligent and sustainable urban planning is based on analysing people’s everyday habits. Hanriette has been following the rapid development of Riga for many years and, in her opinion, reducing car traffic on the roads could make Riga a more modern and socially-friendly European capital, while helping to preserve its historic heritage. Oliver Kolodseike, a Senior Property Economist at Colliers International, shared his thoughts that in the context of investing and attracting people, the biggest challenge for the Baltic cities is retaining its talent and skilled workforce. It is precisely the great potential of industry talent that gives Latvia a significant advantage among neighbouring countries and other European countries, when global competition is only rising. Meanwhile Gijs Klomp, Investment Director at NEPI Rockcastle’s emphasized that from the microeconomic point of view, the Baltic States are very similar and all have a well-educated workforce, positive and growing economies and strong capital cities, however, negative demographic indicators are a definite weak point of the region. Metro ECE Center management representative Zulfukar Tosun wrapped up the forum discussion with his insights on retail, saying that the future of the retail market is the shopping malls that offer more value than just shopping. These centres should be the places where people like to spend their free time, since nowadays just shopping can now also be done online. For this reason, the boundaries between budget and luxury shopping are gradually shrinking all over the world, and both online and on-the-go shopping are becoming more personalized, more interactive and comprehensive, offering multiple product and service acquisition channels. mentioned Ģirts Rūda, General Counsel of RB Rail AS and the moderator of the Forum. A number of other real estate industry experts from all three Baltic countries as well as Ukraine, Finland and the Netherlands were represented among the speakers of the BREL forum, including Keith Silverang, the CEO of Technopolis Plc., Aivaras Abromavičius, Chairman of the Board at Preses Nams, Sohvi Rajamäki, Managing Director at Schneider Electric in the Baltics, Oskars Ozolins, Chairman of the Management Board at construction company Merks, urban planner and architect Oskars Redbergs, Dr.-Ing., Colliers International Advisors partner Angela Kolesnikova, Laurynas Kuzavas, the CEO of SIRIN Development, Founding Partner at SG Capital Harijs Švarcs and founder and CEO of Colonna Roberto de Silvestri, as well as Kārlis Danēvičs, the co-chair of the Leasing Committee of the Financial Industry Association. BREL forum is organized by Colliers International in partnership with iDEA HOUSE events. Event partners: Linstow, Hanner and LNK Group. Colliers International Group Inc. (NASDAQ: CIGI) (TSX: CIGI) is top tier global real estate services and investment management company operating in 69 countries with a workforce of more than 12,000 professionals. Colliers is the fastest-growing publicly listed global real estate services and investment management company, with 2017 corporate revenues of $2.3 billion ($2.7 billion including affiliates). With an enterprising culture and significant employee ownership and control, Colliers professionals provide a full range of services to real estate occupiers, owners and investors worldwide, and through its investment management services platform, has more than $20 billion of assets under management from the world’s most respected institutional real estate investors. Colliers professionals think differently, share great ideas and offer thoughtful and innovative advice to accelerate the success of its clients. Colliers has been ranked among the top 100 global outsourcing firms by the International Association of Outsourcing Professionals for 13 consecutive years, more than any other real estate services firm. Colliers is ranked the number one property manager in the world by Commercial Property Executive for two years in a row. Colliers is led by an experienced leadership team with significant equity ownership and a proven record of delivering more than 20% annualized returns for shareholders, over more than 20 years. For the latest news from Colliers, visit Colliers.com or follow us on Twitter: @Colliers and LinkedIn.